Dr. Swinton and Dr. Boyle are some of the regions best trained and most experienced relationship experts. Dr. Swinton and Dr. Boyle both have masters degrees and PhD’s in marriage and family therapy. Most in the profession only have a 2-year masters degree. Dr. Swinton and Dr. Boyle each received an additional 5-years of PhD education beyond the typical training that most receive with a masters degree. This has provided them with significant additional expertise that can benefit couples and families. 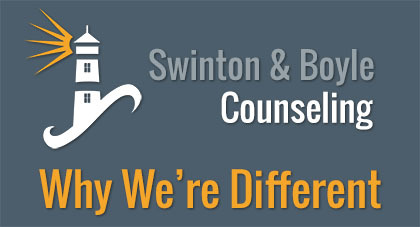 Dr. Swinton and Dr. Boyle are both licensed marriage and family therapists. There are four different types of therapist/counselor licenses that allow counselors to provide relationship counseling in Utah including: marriage and family therapists, mental health counselors, social workers, and psychologists. Most of these licenses do not require a single hour of training or supervised experience assisting couples and families. However, to qualify to receive the exclusive license as a marriage and family therapist, one is required to complete comprehensive relationship graduate school education and at least 2,500 hours of supervised experience treating relationships, couples, and family issues. While the norm in the counseling industry has unfortunately become too focused on encouraging divorce when times get tough, you will see a different hope from Dr. Swinton and Dr. Boyle. They are committed to saving your relationship, not ending it. They have helped couples through nearly everything, so, they are uniquely qualified to help you find the hope and direction you need to save your relationship. They will be the last ones to give up on your relationship.